"The Mole" is the 95th Mandrake Sunday story. The story was written by Lee Falk and drawn by Phil Davis. A series of mysterious and impossible robberies, where it looked like a giant mole had come into the well-guarded vault, awakened Mandrake's interest. In the gould vault of Fort Knox Mandrake faces one of the strangest and most deadly thief in the history of crime, The Mole. The green egg, the world's largest emarald. The Mogul ruby, a priceless ruby. 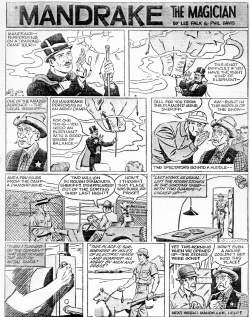 The story title is taken from the strip of August 9, 1964 (Next Week: "The Mole"). Lothar occurs only in the second week of this story. Phil Davis died of a heart attack on December 16, 1964. His wife and assistant Martha Davis continued the art, as seen from early 1965. "L’uomo Talpa", Mandrake - New Comics Now #348 (1995) note: ending with the strip of Desember 27, 1964. This page was last edited on 2 May 2016, at 14:31.